Elmley in Kent is a national nature reserve with Glamping on a family farm. The 3,300 acre estate based on an island in the Thames is situated away from the bustle of North Kent, just an hour from London. A vast wilderness with a spectacular landscape, soul stirring skies and breath-taking wildlife provide a truly inspirational escape. It is a very special place, and provides an extraordinary setting for a special event, weekend escape or simply to immerse yourself in nature for the day. The huts are designed to make the most of the views and to be as comfortable as possible. The friendly owners aim to make sure stays are just what you need, whether it be quiet and relaxed or fun and adventurous and they have thought of most things, but if there is anything else you’d like, just ask. The owners have two young children and live on the farm along with Max, the farm terrier, a number of chickens and hopefully soon some pigs. You’ll see Gareth out on the quad bike most days, working with the livestock and surveying the wildlife, so do ask if you’d like a tour or have any questions about the farm. 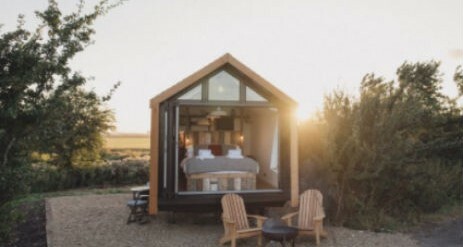 With windows for walls, wake up to sunrise and wilderness views. Lie in bed looking out of the fully glazed end, and keep warm with thick woollen Romney Marsh wool throws, hot water bottles and a vintage cast iron radiator. You will also have a kitchenette, with dining/lounge area and an outside shower?! Little Owl is a wildlife watching paradise. The perfect hideout for nature lovers. The large picture window from the foot of the bed looks out onto oak trees, home to barn owls and little owls. 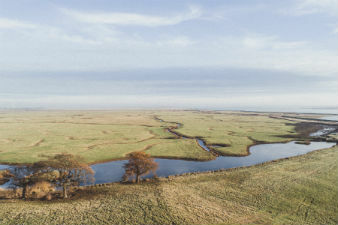 Beyond are unspoilt views across Elmley Island. 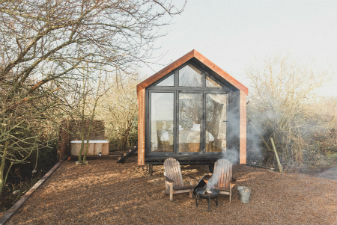 The hut is designed in a traditional style, reflecting the heritage of shepherding across the marsh, but has modern touches to ensure an extremely comfortable adventure. No need for chilly toes in your personal birdwatching hide. The wood burner will keep things toasty and is perfect for cups of tea and simple meals. It is beautifully decorated in a rustic, vintage style. Named after the Ferryman’s Hut that used to sit in the same spot and watch over the Elmley Ferry crossing. 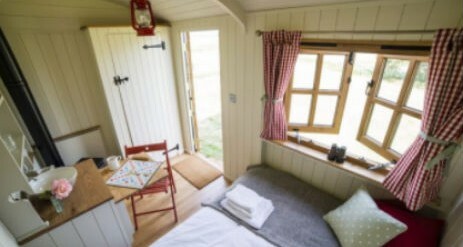 This hut has wonderful water views, and guests can watch hares and owls through the fully glassed end. Keep cosy with thick woollen Romney Marsh wool throws, hot water bottles and a vintage cast iron radiator. You will also have a kitchenette, with dining/lounge area and an outside shower?! 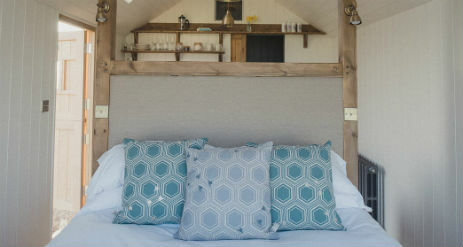 Tucked into the old orchard, resplendent with fruit trees, The Damson is a cosy escape where guests are surrounded by nature, and you can enjoy it all from the comfort of the kingsized bed, through the fully glazed end. The woollen Romney Marsh wool throws, hot water bottles and a vintage cast iron radiator will keep you nice and warm. 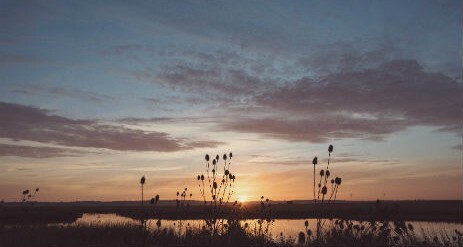 You will also have a kitchenette, with dining/lounge area and from the outdoors vintage bath tub, guests can enjoy the epic marsh views and sunrises Elmley is all about! Toast marshmallows over the cast iron fire pit… marshmallows included! Samphire probably has the best views at Elmley. 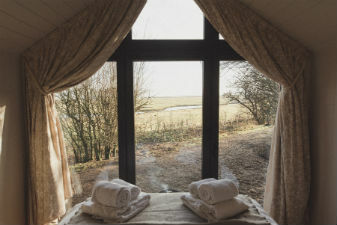 From the comfortable double bed soak in the sweeping vistas across the marsh, Swale Estuary and the mainland beyond. On a clear day you can see Whitstable. In winter spy rafts of wildfowl sheltering on Swale, and short-eared owls gliding over the ponds. 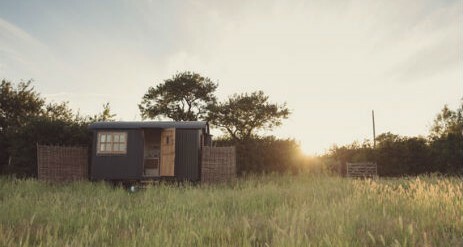 This charming hut has a romantic, nostalgic feel with modern comforts for a very peaceful night’s stay. If you don’t fancy cooking, just relax and scrumptious home made lunch, supper baskets and breakfast rolls which can be delivered to your hut door. All food is locally sourced. 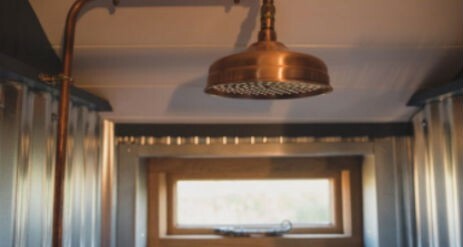 The design and development of these traditionally crafted shepherd’s hut are fully sustainable and complements an eco-friendly approach. Please note: These are the average off-peak rates, please enquire for your dates for an exact quote.